If you're like me, you did not get a fancy Valentine's Day gift in the mail from LEGO [email protected] But luckily, Tohst did and he scanned the little insert that came with it. 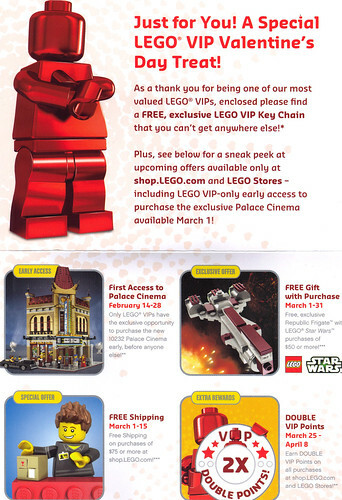 First thing though, about that red chrome minifig keychain: I have it on good authority that the one of the main criteria in selecting who received the gift was based on the frequency of VIP account activity, and not necessarily on dollar amount spent, during the year 2012. So say you made two very large purchases, you would not have reached the proper threshold for receiving the gift. That being said, I would strongly advise against calling LEGO [email protected] begging for one, or worse complaining about it. They are under no obligation to do these types of special programs and giveaways for members, and if all they hear are complaints they will more than likely just cancel the whole thing. For those of you lucky enough to live near a Brand Retail store will remember that they used to have grab bags that were cheap and packed with random parts from the pick a brick bins, store models, customer returns, etc. You wanna know why they cancelled the grab bags? Because someone complained. And LEGO just decided to pull the plug on that. So, please, do us all a favor and be grateful that such a program exists to surprise and delight some customers instead of complaining about not being lucky enough to get one. Early access to 10232 Palace Cinema: Feburary 14 through 28. That starts tomorrow! Free shipping from March 1 through 15. Double VIP points from March 25 through April 8. Usually, during promotional periods like this, there was one day where free shipping would overlap with double VIP points. It doesn't seem to be the case in March, however. Any word on if the frigate will be available outside of the US/North America? Joedward wrote: Any word on if the frigate will be available outside of the US/North America? I live in the UK and got my envelope and keyring delivered last week. The frigate will be for sale free with any orders of £50 or over from 1st-31st March. Though I was expecting it to be an exclusive SW figure like the Shadow ARF Trooper and TC-14 that were each offered in March the last two years. Also, I've gotta say, I used my VIP card at least once a month (and on a different continent - that should count for something) last year, I'm ever so slightly disappointed I didn't get one of these... oh well. Maybe next year... I promise I'm not bitter. Hm, would anyone want one? I'm enticed by the free shipping to pick up the Cinema set early for my birthday. I've seen polybags go for a lot, too. Joedward wrote: Also, I've gotta say, I used my VIP card at least once a month (and on a different continent - that should count for something) last year, I'm ever so slightly disappointed I didn't get one of these... oh well. Maybe next year... I promise I'm not bitter. it's good to see some people value the the key chains so much that they're already selling them on ebay! it's sad that people do this, and just as likely to make Lego stop doing things for VIPs as much as calling them and asking them for stuff does. And free shipping on that part of your order! Sort of. the fine print wrote: [T]he shipping charge associated with item 10232 will be deducted automatically from the user’s cart at checkout. Actually, it looks like shipping is calculated as if 10232 is not part of the order at all...or as if 10232 is the last item calculated. Nice of LEGO to do that. Hopefully the program doesn't get abused. It's a nice incentive to start buying from LEGO directly as opposed to waiting for a big box retailer to have a huge sale. And regarding those grab bags, I totally miss those things. I would almost always grab one when I went to the store. I had no idea someone complained about it to make it go away. Regarding the keychain, it really does not seem like the keychains went to the most active VIPs both in amount spent and amount of activity, just saying... Lego should know that they pissed off a lot of their best customers. Their reaction should be to make sure they use a more fair criteria next time or just let people know what that criteria was. It shouldn't be to say "screw you, no more giveaways.."
I received one, and while I'm not using it as a keychain (that will just scuff it up, or get lost), I have it sitting proudly with my other minifigs. My sons were drawn to it, as well. So, no eBay flipping from this lucky VIP'er! I just got one of these in the mail as well. I'm not sure what the criteria is, but I know it's not frequency. I did make a couple of big purchases last year. Really excited to get one of these! I wasn't expecting one at all. I definitely won't be eBaying this either. Aside from making a few big purchases, especially during the sales and the distribution of promotional things like mini figures and Polybags, as well as Double Your Points. The one thing I did do was use my VIP points that had amounted to a total of £30. Though I would have preferred to continue on building on that I got informed that at the end of 2012 my points would expire. And sadly aside from the Monster Fighter Zombie set which was no longer on the shelves, I ended up purchasing something I wasn't to keen on than rather let those points go to waste. And its a shame though because there are plenty of new releases I would have used them on instead. But anyway this was a surprise to receive in the mail, and like other people I guess I to wont be listing it either on Ebay. Closest ones are over an hour away in either direction, and believe it or not, I have never stepped foot in either one. I'd say about twenty-four miles away from my nearest one. Proximity to a LEGO store must not be a factor as I'm at least 10 hours from the nearest one (I'd never even been in one until my trip to Toy Fair and I forgot to pack my card ) and the spend threshold must be pretty low, as I only made a few small purchases last year. One thing I do often is sign in with my VIP account and screw arround so activity must be a factor. I just received my gift today and intend to call and thank them for it. Share the love and all. If you ever forget your card again, just give them your email and they should be able to find you and give you the points. Could be years until I'm in one again, but I'll try to keep that in mind. I am no where near a Lego store, but visit them here and there when I travel. I do buy quite a bit from the Lego site and was pleasantly surprised to find a chrome keychain in the mail. Certainly won't be selling it on eBay. Don't understand some people. They must have ran to the Internet to post their keychains on eBay.